Some generalized Ky Fan minimax inequalities for vector-valued mappings are established by applying the classical Browder fixed point theorem and the Kakutani-Fan-Glicksberg fixed point theorem. It is well known that Ky Fan minimax inequality  plays a very important role in various fields of mathematics, such as variational inequality, game theory, mathematical economics, fixed point theory, control theory. Many authors have got some interesting achievements in generalization of the inequality in various ways. For example, Ferro  obtained a minimax inequality by a separation theorem of convex sets. Tanaka  introduced some quasiconvex vector-valued mappings to discuss minimax inequality. Li and Wang  obtained a minimax inequality by using some scalarization functions. Tan  obtained a minimax inequality by the generalized G-KKM mapping. Verma  obtained a minimax inequality by an R-KKM mapping. Li and Chen  obtained a set-valued minimax inequality by a nonlinear separation function . Ding [8, 9] obtained a minimax inequality by a generalized R-KKM mapping. Some other results can be found in [10–16]. In this paper, we will establish some generalized Ky Fan minimax inequalities forvector-valued mappings by the classical Browder fixed point theorem and the Kakutani-Fan-Glicksberg fixed point theorem. Now, we recall some definitions and preliminaries needed. Let and be two nonempty sets, and let be a nonempty set-valued mapping, if and only if , . Throughout this paper, assume that every space is Hausdorff. (iv)compact-valued, if is compact in for any . (iv)a weakly maximal point of if . By , , , , we denote, respectively, the set of all minimal points, the set of all weakly minimal points, the set of all maximal points, the set of all weakly maximal points of . Let and be two topological vector spaces, , and let be a set-valued mapping. If is compact, and is upper semicontinuous and compact-valued, then is compact set. Lemma 2.5 (see [2, Theorem 3.1]). Let be a topological vector space, let be a topological vector space with a closed pointed convex cone , , let and be two nonempty compact subsets of , and let be a continuous mapping. Then both defined by and defined by are upper semicontinuous and compact-valued. Let be a topological vector space and let be a closed pointed convex cone in , . Given and , the function and are, respectively, defined by , and . (vi) and are strictly monotonically increasing (monotonically increasing), that is, if ( ), where denotes or . (ii)properly -quasiconcave if for any and , either or . The following two propositions are very important in proving Proposition 2.10. 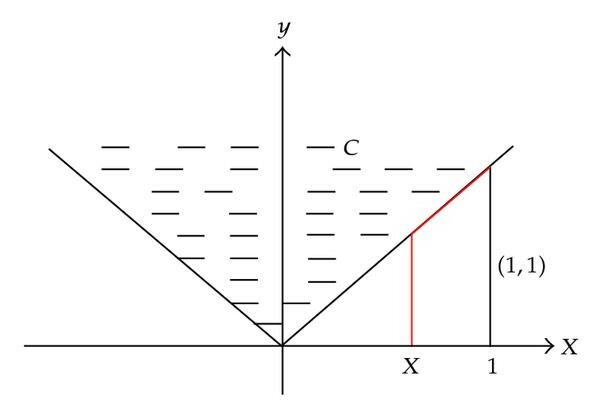 (ii)for any , is convex. (i) (ii) For any , . Let , then . By (i), we have is convex, then . Thus, is convex. (ii) (i) For any , , then for all , . By (ii), we have is convex, that is, . Since is arbitrary, then is convex. (i) (ii) for all and for all , let . By Proposition 2.8, we have is quasiconcave, that is, for any , is convex, then by Proposition 2.9, we have for any , is convex. Thus, is convex. Therefore, we have is convex since by property (i) of . (ii) (i) By Proposition 2.8, we need only prove for all and for all , is quasiconcave, that is, for any , is convex. Thus, for any , is convex since is convex by (ii). Therefore, by Proposition 2.9, we have for any , is convex. In this section, we will establish some generalized Ky Fan minimax inequalities and a corollary by Propositions 1.1, 1.3 and Lemmas 3.1, 3.2. (ii)for each , is open. Then has a fixed point. Lemma 3.2 (see , Kakutani-Fan-Glicksberg fixed point theorem). Let be a locally convex topological vector space and let be a nonempty compact and convex set. If is upper semicontinuous, and for any , is a nonempty, closed and convex subset, then has a fixed point. (i)for all , for any , is convex. Now, we prove that there exists , such that . Supposed for each , , then by condition (i), we have for each , is nonempty and convex. In addition, we have for each , is open since is continuous. Thus, by Lemma 3.1, there exists , such that , that is, , which contradicts (*). Since , then (because of , and Lemma 2.3). By Proposition 2.10, in the above Theorem 3.3, the condition (i) can be replaced by "for each , is -quasiconcave in ". (i)for each , is properly -quasiconcave in . Since is compact, and is continuous, then by Lemma 2.3, we have for any , and . For any , let , then it satisfies the all conditions of Lemma 3.1. In fact, firstly, by , we have , and for each , is open since is continuous. Secondly, by condition (i) and Proposition 2.8, we have is quasiconcave in , that is, for any , is convex. Thus, by Proposition 2.9, is convex. (i)for each , is nonempty convex. Now, we prove that has a fixed point. (1)By the condition (i), we have for each , is closed and convex since is continuous and is closed. (2) is upper semicontinuous mapping. For each , is compact since is compact and is closed. We only need to prove has a closed graph. In fact, Let , and a net in converging to . If for each , is -quasiconcave in and , then the condition (i) holds. Thus, we can obtain the following corollary. Let , and for each , let . By condition (ii), is nonempty. And by condition (i), is convex. Thus, by Theorem 3.6, the conclusion holds. By Definition 2.7, the condition (i) can be replaced by "(i) is properly -quasiconcave in for each ." In Figure 1, the red line denotes the graph of for each . Thus there exists a subnet yet denoted by , and , such that since is closed. Hence, , and . Therefore, is closed. (ii)From Figure 1, we can check that is properly -quasiconcave in for each . (iii)From Figure 1, we can check that for each . Thus, for each . Finally, from Figure 1, we can check that , that is, Corollary 3.8 holds. The author gratefully acknowledges the referee for his/her ardent corrections and valuable suggestions, and is thankful to Professor Junyi Fu and Professor Xunhua Gong for their help. This work was supported by the Young Foundation of Wuyi University.